The Preclassic period lasted from 2000 BCE to 250 CE and saw the emergence of many distinctive elements of Mayan civilization. The Preclassic period itself is further divided into four periods: Early Preclassic, Middle Preclassic, Late Preclassic, and Terminal Preclassic. The Early Preclassic period (2000–1000 BCE) was when the Maya transitioned into an agrarian society. In the Middle Preclassic period (1000–400 BCE), the Mayans built more established cities and expanded through war. Two powerful states emerged in the Late Preclassic period (400 BCE–100 CE). The Mayan civilization collapsed and left the major Preclassic capitals behind at the end of the Terminal Preclassic period (100–250 CE) for unknown reasons. kakaw: An Olmec word for the cacao plant. This word was borrowed and incorporated into the Mayan language, illustrating the relationship between these two cultures. Southern Maya Area: The geographic region in which Mayan civilization first emerged. Kaminaljuyu: The ruling city-state of the Middle Preclassic era. Evidence of stone monuments and complex canals illustrate the power this early capital retained for centuries. The Preclassic period is the first of three periods in Mayan history, coming before the Classic and Postclassic periods. It extended from the emergence of the first settlements sometime between 2000 and 1500 BCE until 250 CE. The Preclassic period saw the rise of large-scale ceremonial architecture, writing, cities, and states. Many of the distinctive elements of Mesoamerican civilization can be traced back to this period, including the dominance of corn, the building of pyramids, human sacrifice, jaguar worship, the complex calendar, and many of the gods. Though the exact starting date of Mayan civilization is unclear, there were Mayan language speakers in the Southern Maya Area by 2000 BCE. It appears that around this time the Maya people began to transition from a hunter-gatherer lifestyle to a culture based around agricultural villages. The process appears to have been a gradual one. Analysis of bones from early Maya grave sites indicates that, although maize had already become a major component of the diet by this time, fish, meat from game animals, and other hunted or gathered foods still made up a major component of the diet. Along with the gradual development of agriculture, basic forms of pottery began to appear, with simple designs and some slipped vessels. Around this time, the Olmec culture began to emerge in nearby Tabasco, granting the early Maya an important trading partner and beginning a period of prolonged contact that would have profound effects on Maya society and artistic production. 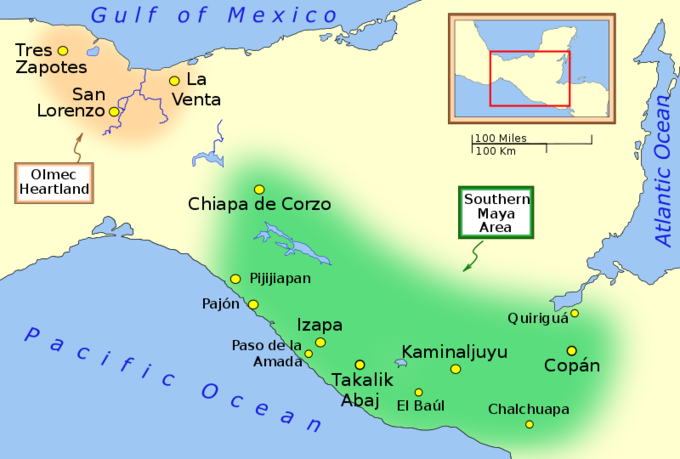 Southern Maya Area: By 2000 BCE, there were speakers of Mayan languages in the Southern Maya Area. Prestige goods, such as obsidian mirrors and jade mosaics, began to appear, increasing the demand for more extensive trade with other language groups, including the Olmecs. Canals and irrigation schemes demanding coordinated human effort began to appear with increasing complexity and scale. Villages began to include central plazas and earthen mounds, occasionally enhanced by masonry. For instance, the site of La Blanca featured a central mound more than seventy-five feet tall. It contained a masonry fragment strongly resembling a head in the distinctive Olmec style. These plazas also suggest a developing religious and hierarchical social structure. Carved stone stele also began to appear during this period, adorned with portraits of rulers but still devoid of writing. Warfare appears to have intensified during this period, as evidenced by advanced weaponry, rulers beginning to be portrayed as warriors, and the appearance of mass graves and decapitated skeletons. Beginning around 900 BCE, the Pacific coastal region fell under the dominance of the La Blanca statelet, which collapsed around 600 BCE, to be replaced by a polity centered around the El Ujuxte site. Another early statelet was probably based at the site of Chalchuapa, a town with extensive earthen mounds arranged around several plazas. However, it was likely ruled by the first true Mayan city-state, Kaminaljuyu. Excavation site at Kaminaljuyu: Complex temples, stairways, and friezes illustrate the acme of this Preclassic city’s power and influence. Lying within modern-day Guatemala City on the shores of Lake Miraflores, Kaminaljuyu developed a powerful government structure that organized massive irrigation campaigns and built numerous intricately carved stone monuments to its rulers. These monuments clearly depict war captives and often show the rulers holding weapons. These images indicate the Kaminaljuyu polity engaged in active warfare and dominated the Guatemalan highlands for centuries. Nakbe Palace: The ruins of a Middle Preclassic palace at Nakbe. During this period, the Olmec culture reached its zenith, centered around the capital of La Venta in modern-day Tabasco near the early Maya centers. Speakers of a Mixe–Zoquean language, the Olmec are generally recognized as the first true civilization in the Americas. Their capital city of La Venta contains extensive earthworks and stone monuments, including several of the distinctive Olmec stone heads. The Olmec share several features with later Maya culture, including extensive jaguar worship, a diet dominated by maize, and the use of the cacao plant. Several words entered Mayan from a Mixe–Zoquean language, presumably due to Olmec influence. These words include the words “ajaw,” meaning “lord,” and “kakaw,” which has become the English words “cacao” and “chocolate. ” Most of these borrowings relate to prestige concepts and high culture, indicating that the Middle Preclassic Maya were deeply impressed and influenced by their northwestern neighbors. Some of the earliest remaining examples of the complex writing system of the Maya appear from the 3rd century BCE. The glyph-based system represents complex concepts and often reflects the religious beliefs of the Maya, including jaguar worship, elites practicing blood letting rituals, and offerings to deities. The Maya also developed the concept of the number zero during this era. The appearance of an explicit number zero in their written records might be the first example of it worldwide. The appearance of this number also helped Mayan architects and priests make exact calculations of the stars and buildings for religious and social purposes. The Late Preclassic also saw the rise of two powerful states that rival later Classic Mayan city-states for scale and monumental architecture—Kaminaljuyu in the highlands and El Mirador in the lowlands. Both cities display the continued refinement in stonework, artistic friezes, and architecture during this era. The Late or Terminal Preclassic murals found in San Bartolo reflect the profound relationship between the Olmec and Maya civilizations over hundreds of years, due to the striking artistic similarities. These murals also provide a window into the Terminal Preclassic sacrificial and inauguration rituals, such as bloodletting, that were practiced around 100 BCE. Elites were expected to perform these painful rituals in reverence to powerful deities. Painted mural at San Bartolo from around 100 BCE: This colorful mural depicts a king practicing bloodletting, probably for an inauguration or other sacrificial purpose. The collapse of the Preclassic Maya civilization remains a mystery, and little is known as to why the major cities were abandoned around 250 CE. However, there were actually two collapses, one at the end of the Preclassic and a more famous one at the end of the Classic. The Preclassic collapse refers to the systematic decline and abandoning of the major Preclassic cities, such as Kaminaljuyu and El Mirador around 100 CE. In fact, the Maya remained an essential part of the region. A number of theories have been proposed, but there is as little consensus as there is for the causes of the more famous collapse between the Classic and Postclassic periods. 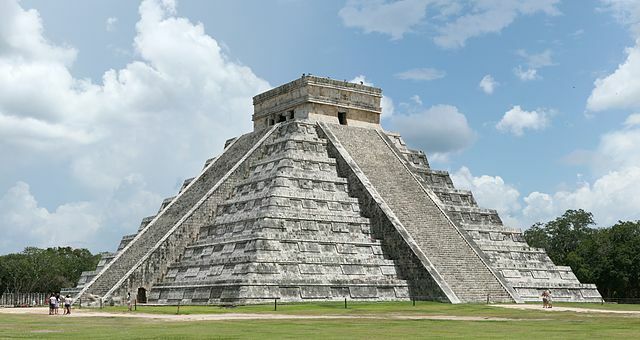 The Classic period lasted from 250 to 900 CE and was the peak of the Maya civilization. The Maya developed an agriculturally intensive, city-centered civilization consisting of numerous independent city-states of varying power and influence. The Maya civilization participated in long-distance trade with many other Mesoamerican cultures and established trade routes between city-states. The Maya used complex calendars to calculate religious, solar, and lunar cycles. The cause of the collapse of the Maya civilization is unknown. stelae: Carved stones depicting rulers with heirogliphic texts describing their accomplishments. Copán: An important city that boasted some of the most complex architecture from the Classic period of Maya history. Tzolkin: This 365-day solar calendar utilized the movement of Earth around the Sun to calculate the year. The Classic period lasted from 250 to 900 CE. It saw a peak in large-scale construction and urbanism, the recording of monumental inscriptions, and significant intellectual and artistic development, particularly in the southern lowland regions. During this period the Maya population numbered in the millions, with many cities containing 50,000 to 120,00o people. The Maya developed an agriculturally intensive, city-centered civilization consisting of numerous independent city-states of varying power and influence. They created a multitude of kingdoms and small empires, built monumental palaces and temples, engaged in highly developed ceremonies, and developed an elaborate hieroglyphic writing system. The political, economic, and culturally dominant “core” Maya units of the Classic Maya world system were located in the central lowlands, while the corresponding peripheral Maya units were found along the margins of the southern highland and northern lowland areas. The semi-peripheral (mediational) units generally took the form of trade and commercial centers. But as in all world systems, the Maya core centers shifted through time, starting out during Preclassic times in the southern highlands, moving to the central lowlands during the Classic period, and finally shifting to the northern peninsula during the Postclassic period. The most notable monuments are the stepped pyramids the Maya built in their religious centers and the accompanying palaces of their rulers. The palace at Cancuén is the largest in the Maya area, but the site has no pyramids. On the other hand, cities like Tikal and Copán illustrate the wealth of architectural accomplishments during these prolific centuries. Copán came to its full power between the 6th and 8th centuries, and included massive temples and carvings that illustrate the full power of its ruling, and often merciless, emperors. Tikal Temple: Classic period temple from Tikal, Guatemala. The cities of Palenque and Yaxchilan were also cultural and religious centers in the southeastern Maya region, and included large temples, ball courts, and even a uniquely vaulted ceiling in the hallway of the Palenque Palace. The Palenque Palace and aqueduct: Cities like Palenque boasted some of the most refined architectural works in the Classic period of Maya culture. Other important archaeological remains include the carved stone slabs usually called stelae (the Maya called them tetun, or “tree-stones”), which depict rulers along with hieroglyphic texts describing their genealogy, military victories, and other accomplishments. 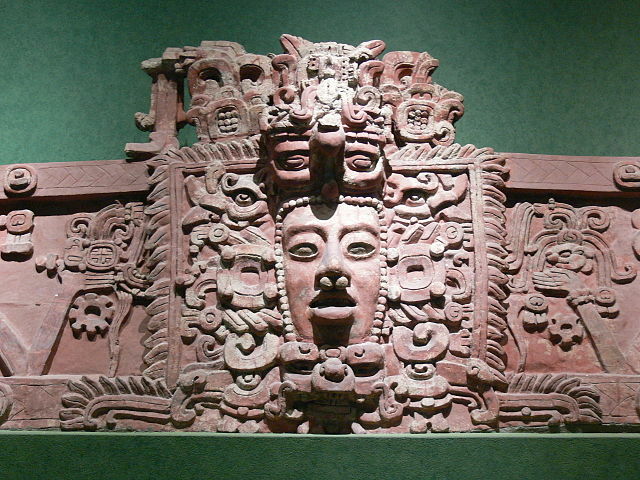 Maya mask: Stucco frieze from Placeres, Campeche. Early Classic period (c. 250–600 CE). The political relationship between Classic Maya city-states has been likened to the relationships between city-states in Classical Greece and Renaissance Italy. Some cities were linked to each other by straight limestone causeways, known as sacbeob. Whether the exact function of these roads was commercial, political, or religious has not been determined. The Maya utilized complex mathematical and astronomical calculations to build their monuments and conceptualize the cosmography of their religion. Each of the four directions represented specific deities, colors, and elements. The underworld, the cosmos, and the great tree of life at the center of the world all played their part in how buildings were built and when feasts or sacrifices were practiced. Ancestors and deities helped weave the various levels of existence together through ritual, sacrifice, and measured solar years. The Maya developed a mathematical system that is strikingly similar to the Olmec traditions. The Maya also linked this complex system to the deity Itzamna. This deity was believed to have brought much of Maya culture to Earth. A 260-day calendar ( Tzolkin ) was combined with the 365-day solar calendar (Haab’) to create a calendar round. This calendar round would take fifty-two solar years to return to the original first date. The Tzolkin calendar was used to calculate exact religious festival days. It utilized twenty named days that repeated thirteen times in that calendar year. The solar calendar (Haab’) is very similar to the modern solar calendar year that uses Earth’s orbit around the Sun to measure time. The Maya believed there were five chaotic days at the end of the solar year that allowed the portals between worlds to open up, known as Wayeb’. A Classic period Maya calendar: Each symbol represents a specific day within the calendar. When the Tzolkin and Haab’ calendar’s are combined they create a fifty-two-year solar calendar. These calendars were recorded utilizing specific symbols for each day in the two central cycles. Calendrical stones were employed to carefully follow the movement of the solar and religious years. Although less commonly used, the Maya also employed a long count calendar that calculated dates hundreds of years in the future. They also inscribed a lengthier 819-day calendar on many religious temples throughout the region that most likely coincided with important religious days. The Classic Maya Collapse refers to the decline of the Maya Classic Period and abandonment of the Classic Period Maya cities of the southern Maya lowlands of Mesoamerica between the 8th and 9th centuries. This should not be confused with the collapse of the Preclassic Maya in the 2nd century CE. The Classic Period of Mesoamerican chronology is generally defined as the period from 300 to 900 CE, the last 100 years of which, from 800 to 900 CE, are frequently referred to as the Terminal Classic. It has been hypothesized that the decline of the Maya is related to the collapse of their intricate trade systems, especially those connected to the central Mexican city of Teotihuacán. Before there was a greater knowledge of the chronology of Mesoamerica, Teotihuacan was believed to have fallen during 700–750 CE, forcing the “restructuring of economic relations throughout highland Mesoamerica and the Gulf Coast.” This remaking of relationships between civilizations would have then given the collapse of the Classic Maya a slightly later date. However, it is now believed that the strongest Teotihuacan influence was during the 4th and 5th centuries. In addition, the civilization of Teotihuacan started to lose its power, and maybe even abandoned the city, during 600–650 CE. The Maya civilizations are now thought to have lived on, and also prospered, perhaps for another century after the fall of Teotihuacano influence. The Classic Maya Collapse is one of the biggest mysteries in archaeology. The classic Maya urban centers of the southern lowlands, among them Palenque, Copán, Tikal, Calakmul, and many others, went into decline during the 8th and 9th centuries and were abandoned shortly thereafter. Some 88 different theories, or variations of theories, attempting to explain the Classic Maya Collapse have been identified. From climate change, to deforestation, to lack of action by Maya kings, there is no universally accepted collapse theory, although drought is gaining momentum as the leading explanation. The period after the second collapse of the Maya Empire (900 CE–1600 CE) is called the Postclassic period. The Maya cities of the northern lowlands in Yucatán continued to flourish. The center of power shifted to the northern peninsula. The Postclassic period was a time of technological advancement in areas of architecture, engineering, and weaponry. The Spanish conquest of the Maya began in the 16th century, but lasted close to 150 years. Mayan languages, agricultural practices, and familial cultures still exist in parts of Chiapas and Guatemala. Mayapan: The cultural capital of the Maya culture during the Postclassic period. It was at its height between 1220 and 1440 CE. Yucatán: A geographic area in the south of modern day Mexico near Belize. Codex: A book containing religious and cultural information written in the Mayan script. Only three of these books remain in the world. The period after the second collapse of the Maya Empire (900 CE–1600 CE) is called the Postclassic period. The center of power shifted from the central lowlands to the northern peninsula as populations most likely searched for reliable water resources, along with greater social stability. The Maya cities of the northern lowlands in Yucatán continued to flourish; some of the important sites in this era were Chichén Itzá, Uxmal, Edzná, and Coba. A typical Classic Maya polity was a small hierarchical state (called an ajawil, ajawlel, or ajawlil) headed by a hereditary ruler known as an ajaw (later k’uhul ajaw). However, the Postclassic period generally saw the widespread abandonment of once-thriving sites as populations gathered closer to water sources. Warfare most likely caused populations in long-inhabited religious cities, like Kuminaljuyu, to be abandoned in favor of smaller, hilltop settlements that had a better advantage against warring factions. El Castillo (pyramid of Kukulcán) in Chichén Itzá: Built by the pre-Columbian Maya civilization sometime between the 9th and 12th centuries CE, El Castillo served as a temple to the god Kukulkan, the Yucatec Maya Feathered Serpent deity closely related to the god Quetzalcoatl known to the Aztecs and other central Mexican cultures of the Postclassic period. Maya cities during this era were dispersed settlements, often centered around the temples or palaces of a ruling dynasty or elite in that particular area. Cities remained the locales of administrative duties and royal religious practices, and the sites where luxury items were created and consumed. City centers also provided the sacred space for privileged nobles to approach the holy ruler and the places where aesthetic values of the high culture were formulated and disseminated and where aesthetic items were consumed. These more established cities were the self-proclaimed centers of social, moral, and cosmic order. If a royal court fell out of favor with the people, as in the well-documented cases of Piedras Negras or Copan, this fall from power would cause the inevitable “death” and abandonment of the associated settlement. After the decline of the ruling dynasties of Chichén Itzá and Uxmal, Mayapan became the most important cultural site until about 1450 CE. This city’s name may be the source of the word “Maya,” which had a more geographically restricted meaning in Yucatec and colonial Spanish. The name only grew to its current meaning in the 19th and 20th centuries. The area degenerated into competing city-states until the Spanish arrived in the Yucatán and shifted the power dynamics. Certain smaller Maya groups, such as the Itza Maya, Ko’woj, and Yalain of Central Peten, survived the collapse in the Postclassic period in small numbers. By around 1250 CE these groups had reconstituted themselves to form competing city-states. The Itza maintained their capital at Tayasal (also known as Noh Petén), an archaeological site thought to underlay the modern city of Flores, Guatemala, on Lake Petén Itzá. The Ko’woj had their capital at Zacpeten. Though less visible during this era, Postclassic Maya states also continued to survive in the southern highlands. The Postclassic period is often viewed as a period of cultural decline. However, it was a time of technological advancement in areas of architecture, engineering, and weaponry. Metallurgy came into use for jewelry and the development of some tools utilizing new metal alloys and metalworking techniques that developed within a few centuries. And although some of the classic cities had been abandoned after 900 CE, architecture continued to develop and thrive in newly flourishing city-states, such as Mayapan. Religious and royal architecture retained themes of death, rebirth, natural resources, and the afterlife in their motifs and designs. Ballcourts, walkways, waterways, pyramids, and temples from the Classic period continued to play essential roles in the hierarchical world of Maya city-states. A religious building at Mayapan along the northern Yucatán Peninsula: Curved walls, complex carvings, and layered platforms illustrate the continued prevalence of architecture in Maya culture and religion during the Postclassic period. Maya religion continued to be centered around the worship of male ancestors. These patrilineal intermediaries could vouch for mortals in the physical world from their position in the afterlife. Archeological evidence shows that deceased relatives were buried under the floor of family homes. Royal dynasties built pyramids in order to bury their ancestors. This patrilineal form of worship was used by some royal dynasties in order to justify their right to rule. The afterlife was complex, and included thirteen levels in heaven and nine levels in the underworld, which had to be navigated by an initiated priesthood, ancestors, and powerful deities. Precise food preparation, offerings, and astronomical predictions were all required for religious practices. Powerful deities that often represented natural elements, such as jaguars, rain, and hummingbirds, needed to be placated with offerings and prayers regularly. Many of the motifs on large pyramids and temples of the royal dynasties reflect the worship of both deities and patrilineal ancestors and provide a window into the daily practices of this culture before the arrival of Spanish forces. Shortly after their first expeditions to the region in the 16th century, the Spanish attempted to subjugate the Maya polities several times. The Maya leaders and people were understandably hostile towards the Spanish crown, and utilized bows and arrows, spears, and padded armor in defense of their city-states. The Spanish campaign, sometimes termed “The Spanish Conquest of Yucatán,” would prove to be a lengthy and dangerous exercise for the invaders from the outset, and it would take some 170 years and tens of thousands of Indian auxiliaries before the Spanish established substantive control over all Maya lands. Pages from the Paris Codex: One of three surviving examples of Mayan writing, the Paris Codex offers keen insights into religious and patrilineal traditions before the Spanish invasion. Unlike the Aztec and Inca Empires, there was no single Maya political center during the Postclassic period that, once overthrown, would hasten the end of collective resistance from the indigenous peoples. Instead, Spanish forces needed to subdue the numerous independent Maya polities almost one by one, many of which kept up a fierce resistance. Myths of gold and precious metals motivated many Spanish forces to capture and dominate the Maya lands. However, the Yucatán does not offer rich mining opportunities, and some areas were difficult to navigate because of the dense jungle environment. As the battle over control of the region waged on, the Spanish church and government officials destroyed the vast majority of Maya texts and, with them, a large swath of knowledge about Maya writing and language. Fortunately, three of the pre-Columbian books dated to the Postclassic period survived the Spanish invasion and destruction of Maya culture. These are known as the Madrid Codex, the Dresden Codex, and the Paris Codex. The last Maya states (and the last indigenous holdouts from Spanish control in the Americas)—the Itza polity of Tayasal and the Ko’woj city of Zacpeten—remained independent of the Spanish until late in the 17th century. They were finally subdued by the Spanish in 1697 after many casualties. Although Spanish weaponry, administration, and practices became much more dominant throughout Mesoamerica by the 17th century and onward, the Maya people persisted, along with many of their essential traditions. Today, in remote parts of Guatemala and Chiapas, similar familial configurations, uses of the 260-day Maya calendar, and agricultural practices continue to shape families of descendants. Millions of Mayan-language speakers inhabit their ancestral lands and keep these languages and traditions alive.